For many of us, saving money is one of the hardest thing to do, especially nowadays that prices of almost all goods and services are increasing. In spite of this, we need to save. Because there are many reasons to do so. Saving money should start, a moment you are earning, regardless of your age or marital status. If you haven't saved for a long time despite the fact that you are working for a decade, you should start saving now. Your savings can turn into investment someday. You can also use the money as a capital for business, a preparation for the future needs of your family or for your retirement. You may ask, what should I do to save? There are many things you can do to save money. But first, evaluate your lifestyle and break some spending habit that you do not need in the very first place. 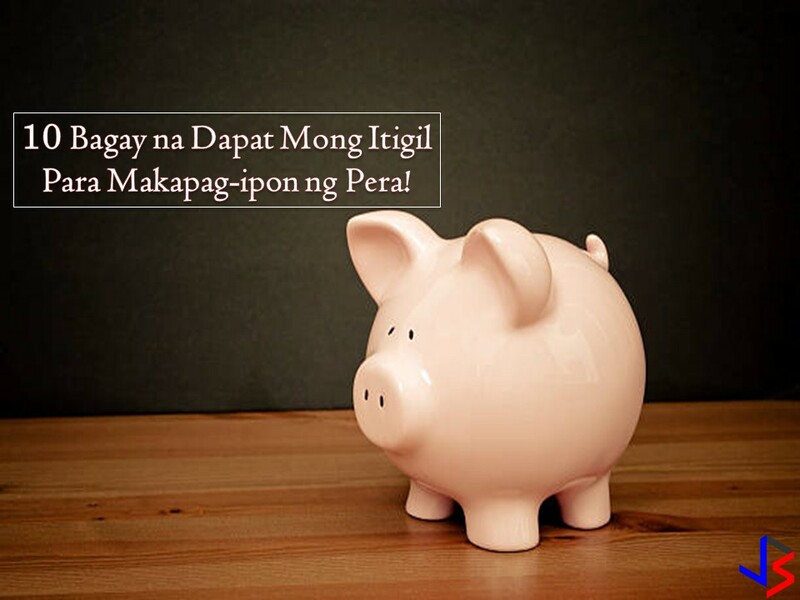 The following are 10 spending habit that we need to break to save! This is very common among millennials or even adults nowadays. Living and enjoying the moment because you only live once. Spending money on travel, shopping, dining, gym membership, gadgets among others are now the way of life for many. Indeed YOLO is good for a person's overall well-being. But enjoying life for a short moment then suffering for sleepless nights for a month or two worrying about money or on how to pay your debt is not healthy at all. Yes, you only live once and life is meant to be enjoyed, but it should not make you broke or in debts. Instead, "you should enjoy the moment but prepare for retirement". "Bahala Na si Batman" should not be our "mantra". Spend below your means and not within your means. Nothing is left for savings if you spend within your means. If your hobbies like traveling can hurt your savings, do it seldom or once in a year or two. There are many who's guilty of this. When stressed or bored or feeling down, the next option is going to the mall and spend mindlessly on things that we don't actually need. Shopping, eating, binge drinking etc. The result is overspending. It is never wrong to treat yourself for the things that you love since you are working hard for your money. But using this as an excuse to spend more is not a good idea at all. To stop, put a limit to each of your expenses whether it is a need or wants. Also, there are many things to do when you are stressed, bored or feeling down aside from spending money! Applying for a loan to support your lavish lifestyle? Getting a loan to fund your travel or for buying a new smartphone or any other short-term needs is a bad idea. Remember, the loan comes with interest that you need to pay. Make sure your monthly income can compensate the payment needed plus the interest. If it is for the right reason, taking a loan or borrowing money is not bad at all. For example, you need money for long-term investment or for a capital to start a small business where you can earn in return. If your borrowing money for dead investment, make sure it is worth it and it won't kill your budget afterward. Social media is now part of people's lives. We love to share our vacation photos, new things we bought, the places we visit or restaurant we dine and so son. We love to have many "likes" on beautiful images we upload in social media that sometimes we are spending much on our social media image. Trying to impress people or "Keeping up with the Joneses" to maintain our good and successful image in social media is costly. If you want to save, you should stop this habit and focus on your personal growth. In saving money, budgeting is one of the keys. One way to do this is to track your expenses so that you will know where did your money go. Make a list when going to grocery stores to avoid over expenses. Set aside a budget for utility bills and other expenses in the house and so on. If you have a record of your expenses you can evaluate your spending in a month. You can carefully study what are the needs and wants and adjust your spending for the next month for possible additional savings. You can review your expenses and see which ones you can cut back on. Every one of us has a different formula for saving money but the question is, it is effective? If you don't have savings up to now then you need to try the "Pay Yourself First" formula. It means when you received your salary, the first thing to do is set aside the fixed amount as a saving before spending. So the formula should be Income - Savings = Expenses. It is very common for us to save what is left with our money. But if we practice this, nothing will be left for savings in the end especially if we are living paycheck to paycheck. Often times we pay the price of convenience much more the price of the product or services we get. Eating lunch every day in the fast food instead of cooking and bringing "baon" for lunch will cost you much. Riding a taxi to work regularly instead of a jeep or bus will make you spend more than what is intended. Aside from the actual services and product, you are paying for the convenience of the situation being given to you. Look for another way instead so that you can save. List down a weekly menu, cook and bring food in your workplace instead of buying in the nearest fast food or carenderia. If you are using a credit card, make sure to pay on time all your dues. Unpaid dues will accumulate interest. Not just your credit card but all your debt or loans. Avoid debt if it is not necessary. Your money will slip through your fingers easily if you don't know how to say no in all the invitation or favors being asked to you. Even if you are earning big, learn on how to say No to unwanted expenses to give way for your savings. Also, say no to each temptation to overspend. If you want to save, consider cutting your vices. Prices of sin products such as cigarettes and liquor are not cheap. Imagine how much you can save in month from consuming a pack of cigarettes a day. Not just this, this vices can harm your health in a long way that can also hurt your finances. Aside from this, you can also cut your addition on too much coffee or soft drinks or gambling. This article is filed under savings and investment, financial plan, finances, savings account, tips for savings, savings and expenses and credit cars.